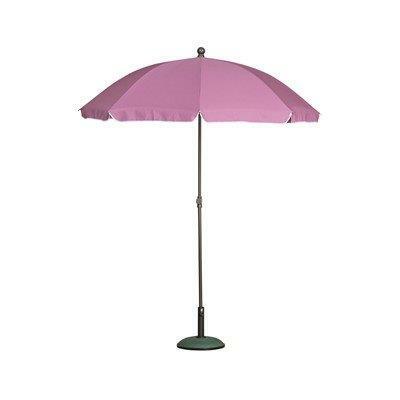 Brighten up your garden with this delightful sun umbrella. The violet coloured “black cherry” Fruit Cocktail garden and beach parasol lets you relax and enjoy the sun, all under a 2 metre span canopy. Primary use is as a sunshade although it is also a shower proof garden umbrella. Protective against UV rays and shower resistant, this brolly is made from a sturdy steel frame with good quality, secure fittings. Can be used both as a garden parasol or beach parasol. When you’ve finished relaxing by the beach, you can quickly store the parasol in the included colour coordinated carry bag. A bright cheerful sun parasol which can be used in the garden, on the beach, on picnics or as a street umbrella outside a cafeteria or bistro. A shower resistant and UV protective sun shade. A sturdy steel framed sun umbrella with quality fittings. Comes with a smart matching storage bag with shoulder strap. Height adjustable with tilt mechanism.